After today, I’ll be at the end of four full days here in Tokyo. The days have been so busy — I already feel as though I’ve been here a month (in a really great way)! My host-family is absolutely incredible; the whole family –consisting of Masumi-san (the mama), Yasuaki-san (the father), Taisuke (the older brother), and Shuuko-san (the younger daughter) — has been so warm and welcoming. They live in Uehara, Shibuya-ku, a really nice neighborhood southwest of Tokyo’s downtown area. 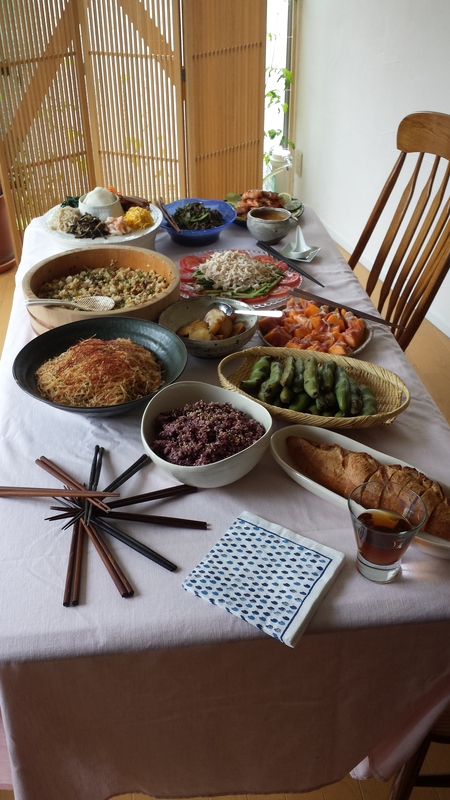 My host-mother, who is a stay-at-home mom, has been staying-at-home with me and facilitating both constant activity and plenty of Japanese practice. Each day so far, she’s taken me along to meet her friends or sent me off with one for some other adventure, the end result always being a handful of new Japanese friends (frequently middle-aged mothers), lots of Japanese practice, and (perhaps best of all) consumption of incredible homemade 和食 (washoku, Japanese cuisine). On my first full day, she brought me to a potluck lunch with five of her friends; yesterday, her older sister took me along to a さど (sado, tea ceremony) lesson! Needless to say, I feel so lucky to have an incredible new family here in Japan. Here are a few general interest photos; I’ll start posting more topically next time! 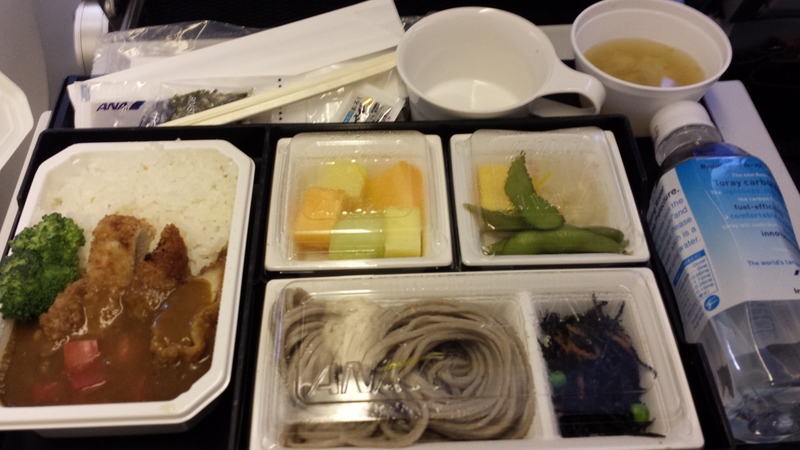 My first Japanese meal! Took place on a plane. 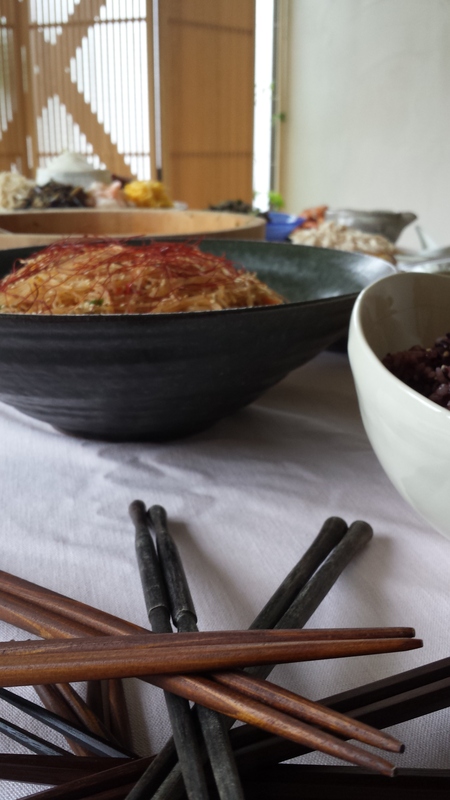 An amazing potluck lunch during my first full day. 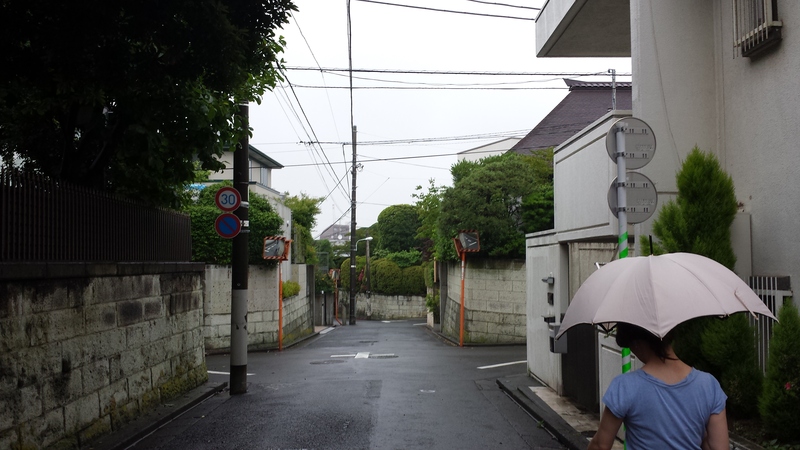 My host mom, walking down the street in Uehara, the neighborhood I now (for the next two weeks) call home! A quarter panorama of my tatami floored bedroom. No shoes or slippers allowed! That’s all for now. Good luck and much love to all. Treasure every day! PS. Shout out to my dad for Father’s Day (Happy Father’s Day, Dad!). I briefly Skyped with him today and forgot to mention it. Damn. This entry was tagged home stay, Japan, Japanese food, Tokyo. Bookmark the permalink. It was very nice to talk with you. I am glad that you have such a nice host family. The food in the potluck looks great. You will gradually come to understand more what people are saying. You are there only 4 or 5 days. Thanks for the happy father’s day shout. You did not look that you had a jetlag. fantastic! what a charming, lovely family!